Streptocarpus Dimetris • View topic - Do baby streps like to live in colored houses? Do baby streps like to live in colored houses? Post subject: Do baby streps like to live in colored houses? A few years ago, in our strepbystrep Facebook group, somebody asked if it is ok to grow Streptocarpus in clear but colorful plastic boxes. We also called them “mini-green houses” or “domes”. Nobody knew the answer, including me. First of all, I need to point out that Streptocarpus cannot be grown for a long time in closed plastic boxes where 100% humidity will be detrimental for growth and flowering. However, small seedlings require higher humidity and can be very happy in these boxes. But what about colored plastic? The way our eyes perceive it is different from the way plants use different wave length photons. 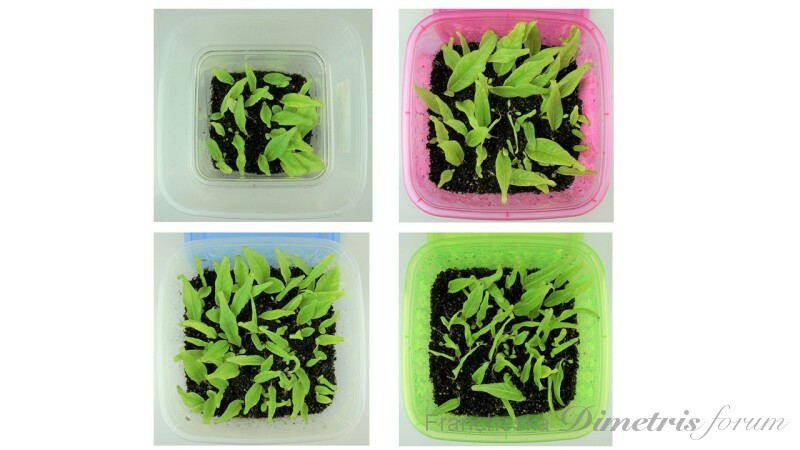 To know how suitable these boxes, and the light coming through them, will be for the plants, the best tool to use is an optical spectrometer. Unfortunately they are very expensive. Another way to do this is set up an experiment. Though this is not a very important one, it’s very easy to do. Once I saw the beautiful pinkish-red, green, and blue boxes, I decided to give it a try. As a control, I used a regular clear plastic box. In the following picture you can see the boxes. The clear one is slightly smaller but the main problem was with the "blue" one. The sides of the blue one were actually clear, only the lid was blue. To make things equal, I had to cover the sides of all of them with foil so that the only light getting in was through the tops. Then I filled them about 1/4 full with soil and planted the seedlings (from the same cross) as follows: I took four identical "large" seedlings (about an inch long) and put one in each box; I found four more "small" seedlings and planted them in each box, and so on, until they were full, so that each box would have an equal representation of plants. In the photos, you can see that the boxes are without lids. The experiment was started January 25. On March 5 they looked like this. As you can see, the leaves in the green box look slightly narrower than the ones in the other three boxes which look almost identical. Though the penetrating and reflective light in the green box appears green to the human eye, to measure this exactly we would need a $5,000 spectrometer. However, after thinking about this for a minute, I decided to postpone that purchase! For most humans, green light has a calming effect, this also appears to be the case for my seedlings because green light practically does not participate in photosynthesis. Finally, as you can see, the results were the same. The leaves had started to deform because they were restricted by the lids. 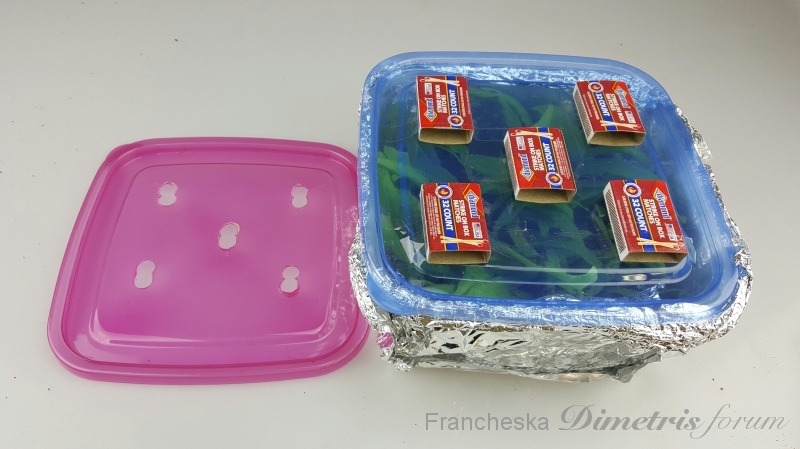 I was happy to throw them away because I have many more important experiments but again, Pavel Enikeev, founder of our company, Dimetris, begged me to continue. 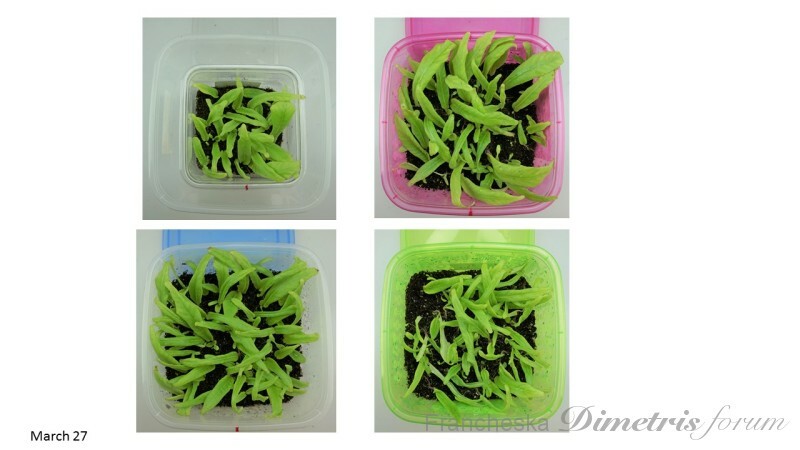 2) I had not added any fertilizer for the duration of the experiment. 2) To reduce humidity I had to be creative to promote air and moisture exchange with the outside without letting additional light in. 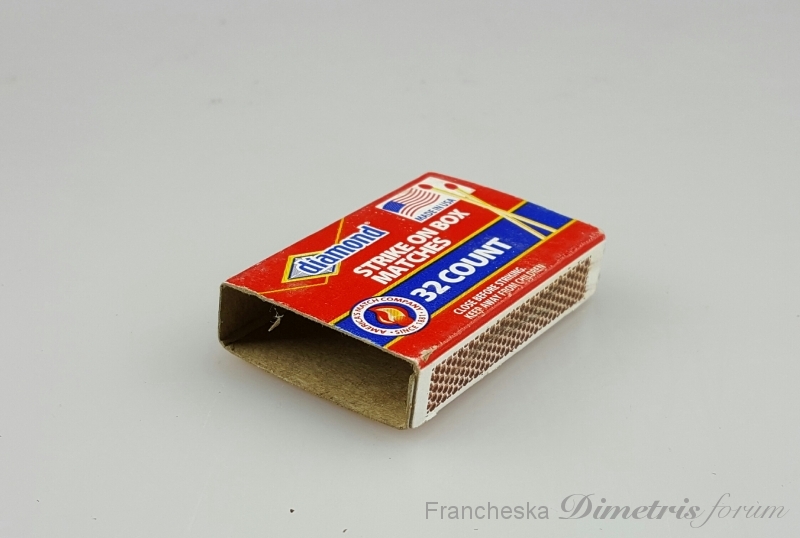 To do this, I cut holes in the lids and in the bottom of matchboxes, as shown, and attached the matchboxes over the holes. In this way, air could move in and out but unfiltered light would not get in. I did this with all four lids. After a month, the end result was the same: there was no difference from one colored container to another. 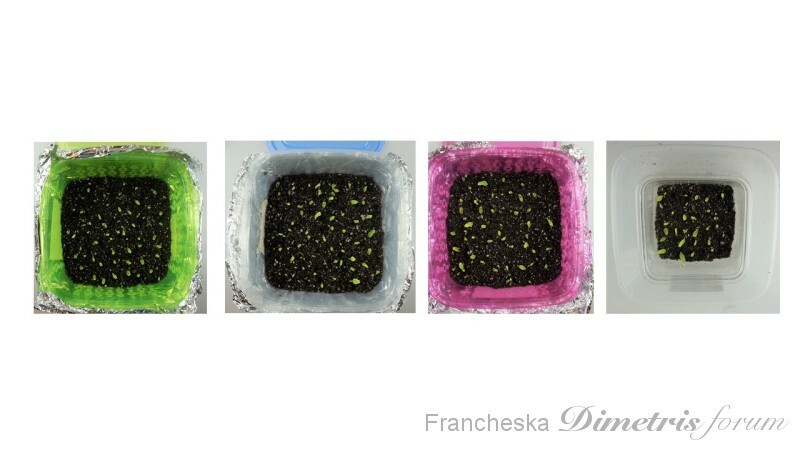 I can say pretty conclusively that, based on this evidence, do not be afraid to grow your seedlings in translucent orange, red, pink, purple, blue, or clear containers, as long as they permit light to get in. Green will work but not quite as well.